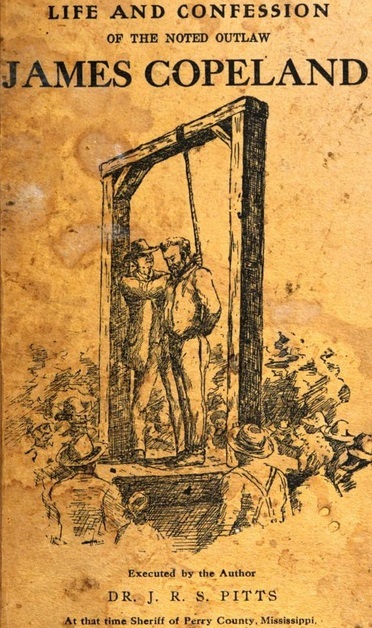 On this date in 1857, “the great southern land pirate” James Copeland went to the gallows in the now-abandoned Mississippi town of Augusta. 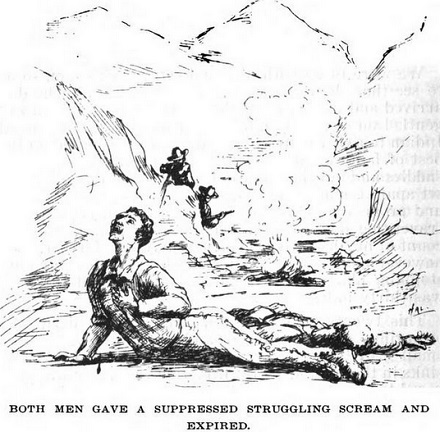 After an “introduction”, a “preface”, and an “explanatory”, our volume comes at last to an illustrated 100-page autobiographical narrative which Pitts says that Copeland dictated to him while cooling his heels in jail. Having fallen into a legal scrape for pig-thieving, Copeland left behind charming rascality for Godfather territory when he made contact with an outlaw named Gale Wages and concocted a plan to vacate the charges by destroying the documentation … by torching the courthouse in which they rested. “Such a sight I never had before beheld,” Copeland remembered of the blaze. “The flames seemed to ascend as high, if not higher than the tops of the tallest pine trees; they made everything perfectly light for over two hundred yards around.” After that bonfire, Copeland gave himself over to the guidance of a man who turned out to be halfway between Jabba the Hutt and a Masonic lodge chief. I was there introduced by Wages, (who was their president,) as a candidate for membership, I should have been rejected, had Wages not interceded for me. I was finally passed and admitted to membership. Wages then administered to me the oath, which every member had to take. I was then instructed and given the signs and pass-words of the Clan. Maybe the gang was right to doubt him, for Copeland broke this oath by divulging to his hangman-biographer numerous names of members as well as the Encyclopedia Brown-esque cipher this gang used to send coded messages. A legend of $30,000 in gold that the squad claimed to have buried in Catahoula Swamp still circulates in Mississippi — spur to thus-far frustrated treasure hunters down to the present day. We can’t know to what degree the voice that we read is Copeland’s own or that of Pitts interposing but the narrator we have affects at times a stagey horror at his sins. With the gang determined to be rid of an Irish boatman on the Mississippi, Copeland draws the short straw to bludgen him to death in his sleep: “Oh, God! when I look back, it makes me shudder. Even now it chills the blood in my veins.” Copeland bashed his brains in with a hatched and as day broke they slipped the weighted corpse into the river. The end of the line could really have been any one of these incidents or the numerous others this post elides — enough blood feuds and hand-to-hand murders and the odds are sure to turn against you in the long run. and became intoxicated, and in that situation I imagined every man I saw was trying to arrest me. I fell in with a man by the name of Smith, an Irishman, and a difficulty occurred between us; I concluded that he intended to arrest me. I drew my double-barrel shot gun upon him and intended to kill him. He was too quick for me; he threw up my gun, drew his dirk and stabbed me just above the collar bone. Having made himself both conspicuous and immobile, Copeland was tracked down by a posse and now he was really in the soup: “one indictment against me in Alabama for larceny, and another against me in Mississippi for murder.” Copeland pleaded guilty in Alabama and served a jail sentence there, hoping that the passage of years would buy him some opening to escape the hanging sentence that would surely await in neighboring Mississippi. But the Magnolia State was on its game and had a timely extradition request ready to receive James Copeland the moment his term in the Alabama pen expired. The day arose clear and beautiful on which the sentence of the law and of outraged humanity was to be executed on the man who had so often violated their most sacred behests. The sky was blue and serene; the atmosphere genial; all nature was calm and peaceful; man alone was agitated by the various strong emotions which the execution of the fatal sentence of retributive justice on a fellow-man could not but create. The place of execution was distant from the city of Augusta one-quarter of a mile. The gallows was erected on a beautiful elevation that was surrounded by the verdure of shrubby oak and the tall, long-leaf pine. The ground was everywhere occupied by thousands of spectators, gathered from Perry and the surrounding counties, to witness the solemn scene. It was indeed one that they will long remember. About the hour of noon, the prisoner, after being neatly clad, was led from the jail by the officers of the law, placed in the ranks of the guard formed for the occasion, and the procession moved slowly toward the fatal spot. Soon the doomed man appeared on the gallows. The death warrant was then read to him, and he was informed that he had but a short time to live. He proceeded to address the awe-struck and silent multitude. He especially urged the young men present to take warning from his career and fate, and to avoid bad company. His misfortune he attributed principally to having been mislead while young. When he had concluded, a number of questions were asked by the immediate spectators, in relation to crimes which had transpired within their knowledge; but he would give no direct answer — shrewdly eluding the inquiries. The Sheriff then asked him, in hearing of many lookers on, if the details of his confession, previously made to that officer, were true. He replied that they were. His hands were then tied and the cap pulled over his face, and he was told that he had but a few moments to live. He exclaimed, “Lord, have mercy on me!” and he was praying when the drop fell, and a brief struggle ended his blood-stained career.